I've been reminded that I have never featured The Wallace Collection on Coxsoft Art News, mainly because it doesn't hit the headlines. 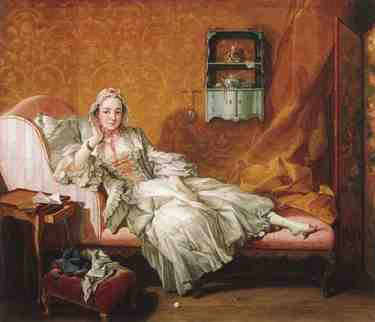 It's simply one of Europe's finest collections of French 18th Century paintings, furniture, arms, armour and porcelain. Find it at Hertford House, Manchester Square, London, WIU 3BN. Admission is free, so it would be an excellent place to lose the cherubs during the summer hols. Its current art exhibition is Boucher and Chardin: Masters of Modern Manners, which features this Boucher painting on loan from the Frick Collection in New York, A Lady on Her Day Bed (1743), in Britain for the first time in 70 years. And feminists try to make out ladies were downtrodden in olden times. Pampered, more like it.